Carey is a hub of innovative learning, progressive thinking and curricular diversity. Wise educators, like those at Carey, are always on the lookout for new pedagogies and materials that expand classroom learning opportunities and amplify student potential. We focus on methods that foster the development of enterprise skills in students and provide opportunities to solve future problems most of us haven’t even imagined yet. One such initiative at Carey is the SandPit in the CLI. This open space allows students, staff and members of the Carey community to play, explore and imagine; to test, build and learn; and to create, make and break! They can engage with robotics, engineering, programming, coding and mechanics, among many other things. They have access to endless resources – from robots to pipe cleaners – to enable them to let their imaginations run free to create anything they come up with. In this environment, students are able to connect with other like-minded people from all different year levels, creating strong support networks and a community of peer mentors. This space is for anyone at Carey who is interested in the practical applications of STEM to learn new skills and play with advancing technologies. Budding technology leaders are provided with a platform to promote hands-on learning and creation, giving them a different kind of applied STEM experience. Roles are often reversed as students eagerly take centre stage to share their knowledge as they test devices to understand how they work. When working in the SandPit, staff and students are encouraged to think critically, develop patience and build resilience. Students who visit the space help to promote a hands-on multi-disciplinary approach to learning, with the opportunity to break things and fail and to use these experiences to learn about how things work. They also develop leadership skills and a strong sense of belonging as they share their successes with a global audience through the SandPit Twitter and Instagram accounts. Carey has even been contacted by tech companies to have our students test their new products in the SandPit. For example, Carey students were able to trial the HP Sprout before it went on the market! There are several programs run from the SandPit, including the two-day intensive Year 7 Dwelling Project. Using a design-thinking framework, students take on a profession and work together to develop a miniature dwelling and find solutions to real issues. Engineers make solar-powered lighting and cars and interior designers create wallpaper and soft furnishings, while fashion designers, carpenters, chefs and media designers bring the house to life. Students account for the dwelling’s carbon footprint and production budget, and when it is completed, it is given to BaptCare as a Christmas gift for a child experiencing hardship. Carey has never been a school to ‘bury its head in the sand’ when it comes to progressive thinking and embracing learning styles that are best for our students. 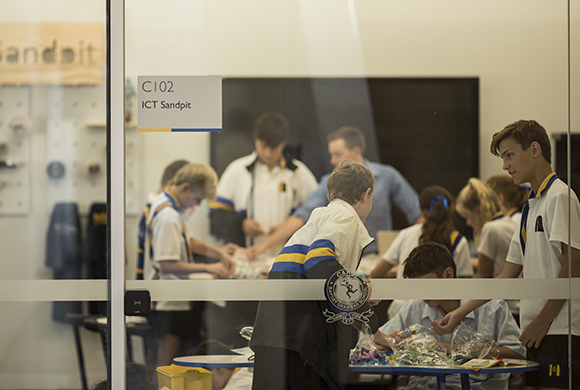 This has enabled us to drive exciting, engaging and productive learning initiatives like the Carey SandPit.